This article is about the film. For other uses, see Falling Down (disambiguation). Falling Down is a 1993 thriller film directed by Joel Schumacher and written by Ebbe Roe Smith. The film stars Michael Douglas in the lead role of William Foster, a divorced and unemployed former defense engineer. The film centers on Foster as he treks on foot across the city of Los Angeles, trying to reach the house of his estranged ex-wife in time for his daughter's birthday party. Along the way, a series of encounters, both trivial and provocative, causes him to react with increasing violence and make sardonic observations on life, poverty, the economy, and commercialism. Robert Duvall co-stars as Martin Prendergast, an aging Los Angeles Police Department sergeant on the day of his retirement, who faces his own frustrations, even as he tracks down Foster. William Foster is recently divorced, and his ex-wife Beth has a restraining order to keep him away from their young daughter, Adele. In addition, he was recently laid off from his job. His frustration grows when his air conditioning fails while he is stuck in traffic. He abandons his car and begins walking across Los Angeles to attend Adele's birthday party. Sergeant Prendergast, who is on his last day before retirement, insists on investigating the crimes. Interviews with the witnesses at each scene lead Prendergast to realize that the same person may be responsible. Foster's "D-FENS" vanity plate proves to be an important lead, because Prendergast remembers being in the same traffic jam as Foster earlier that day. Prendergast and his partner, Detective Torres, visit Foster's mother, who is surprised to learn that Foster lost his job. They realize Foster is heading toward his former family's home in Venice, Los Angeles and rush to intercept him. Foster passes a bank where a black man is protesting being rejected for a loan application. The man exchanges a glance with Foster and says "don't forget me" as he is escorted away by police. Foster stops at a military surplus store to buy a new pair of shoes. The owner, a white supremacist, indirectly insults two men for their sexual orientation and diverts Torres' attention when she comes in to ask questions. After she leaves, he offers Foster a rocket launcher, and congratulates him for shooting "a bunch of niggers" at the Whammy Burger. When Foster expresses distaste for the store owner's racism, the man pulls a gun, tells him he is "going to jail" and attempts to handcuff him, but Foster stabs him with the gang member's knife, then shoots him. He changes into army fatigues and boots, takes the rocket launcher, and leaves. At the end of the pier, Foster confronts Beth and Adele. Adele is happy to see him, but Beth believes that he has come to kill them. Prendergast arrives and intervenes. He acknowledges Foster's complaints about being ill-treated by society, but does not accept that as an excuse for his rampage. Distracting Foster, Beth kicks the gun away as Prendergast draws his revolver, insisting that Foster give himself up. Foster pulls a water gun, tricking Prendergast into shooting him dead. Falling Down was being shot on locations in Lynwood, California when the 1992 Los Angeles riots began. By April 30, the riots were sufficiently disruptive to force filming to stop early that day. Film crews produced more footage inside of Warner Bros. Studio, in Burbank, as the riots continued. By May 4, when the crew intended to resume in Pasadena, initial requests to do so were denied, causing delays. Filming wrapped in late June 1992. Production designer Barbara Ling said, "We mapped this so that you really were going across [Los Angeles] from Silver Lake down to mid-city to Koreatown." Foster's signature haircut was the idea of Joel Schumacher and the movie's hairstylist Lynda Gurasich. Douglas commented on how it helped him get into the character of a veteran of the military or defense industry, "It gave me the feeling of the late 50s and the early 60s, and somehow my character you kinda have the feeling that he came from another time, or he wished or he hoped for another time when things made sense." Douglas would add concerning the character, "There's a lot of people who are a paycheck away from being on the streets and being out of work who did everything right, they've been responsible, they tried hard, [and] they don't know what went wrong! We won the war, where's it all at?" The film grossed $40.9 million against a $25 million budget. It took the top spot in United States domestic box office totals in its first two weeks of release (February 26–28 and March 5–7, 1993). Falling Down pushed the previous top movie, Groundhog Day, into the second place box-office spot for both those weeks. Reviews for the film were generally positive. Falling Down holds a 73% "Certified Fresh" rating on Rotten Tomatoes and a score of 56 out of 100 ("mixed or average reviews") on Metacritic. Vincent Canby of The New York Times called it "the most interesting, all-out commercial American film of the year to date, and one that will function much like a Rorschach test to expose the secrets of those who watch it." Philip Thomas of Empire magazine wrote in his review of the film, "While the morality of D-Fens's methods are questionable, there's a resonance about his reaction to everyday annoyances, and Michael Douglas' hypnotic performance makes it memorable." James Berardinelli wrote: "Falling Down is replete with gallows humor, almost to the point where it could be classified as a 'black comedy'." John Truby calls the film "an anti-Odyssey story" about "the lie of the American dream". He adds "I can't remember laughing so hard in a movie." This guy is you, the movie suggests, and if not you exactly, then maybe the guy you're one or two bad breaks from becoming. At one time or another, we've all thought these thoughts, and so when this downtrodden, laid-off, teed-off L.A. defense worker gets out of his car on a sweltering day in the middle of rush hour and decides he's not going to take any more, it comes as no surprise", adding "as he did in Fatal Attraction and Wall Street, Douglas again takes on the symbolic mantle of the Zeitgeist. But in Falling Down, he and Schumacher want to have their cake and eat it too; they want him to be a hero and a villain, and it just won't work. At the time of its release Douglas's father, actor Kirk Douglas, declared "He played it brilliantly. I think it is his best piece of work to date." He also defended the film against critics who claimed that it glorifies lawbreaking: "Michael's character is not the 'hero' or 'newest urban icon'. He is the villain and the victim. Of course, we see many elements of our society that contributed to his madness. We even pity him. But the movie never condones his actions." In 2012, Tasha Robinson of The A.V. Club was critical of the '90s film "that most stands out for me from that era, because it's such a ham-handed, wrong-headed, self-congratulatory attempt to encapsulate its era's spirit". Robinson added "the film treats virtually everyone around him [D-FENS] as worthless, and presents his violence as the comedic payoff, turns it into a tone-deaf, self-pitying lament about the terrible persecution facing the oppressed majority in an era of political correctness and increasing multiculturalism." She finishes her short review with, "It's a profoundly hateful film disguised alternately (and erratically) as either tragedy or humor." An earlier 2008 review on the site said, "Heat used as a metaphor for simmering rage is nothing new, but few films execute sweaty psychosis as well." On the 25th anniversary of the film's release, film critic April Wolfe of LA Weekly wrote that it "remains one of Hollywood's most overt yet morally complex depictions of the modern white-victimization narrative, one both adored and reviled by the extreme right". Wolfe said "Today, we might see D-Fens and the white supremacist as the infighting sides of the far right — one couches racism in coded words like "thug," while the other wants an outright ethnic cleanse. Ultimately, what both want is to return to their idea of a purer America, unburdened by the concerns of minorities and women". Wolfe suggested that Rupert Murdoch would "go on to bottle that fury and package it as patriotism" in creating Fox News. Contextually, Falling Down was released in theatres less than one year after the 1992 Los Angeles riots. In them, the targeting of Korean-Americans and their businesses by rioters was a point of fact. The Korean American Coalition and Korean Grocers Association protested the film for its treatment of minorities, especially the Korean grocer. Warner Brothers Korea canceled the release of Falling Down in South Korea following boycott threats. The outcry by the Grocers Association in particular was sufficient to see Michael Douglas meet with members at Warner Brothers Studio because they "were there and they were pissed. So we had a conversation and I told them, 'Look, I'm very sorry, but there's a reason the screenwriter picked certain things to put in the film.'" Unemployed defense workers were also angered at their portrayal in the film. Falling Down has been described as a definitive exploration of the notion of the "angry white male"; the character of D‑FENS was featured on magazine covers, including the March 29, 1993 issue of Newsweek magazine, and reported upon as an embodiment of the stereotype. Cynthia Hurley, the former wife of Craig Stephen Hicks (the accused in the 2015 Chapel Hill shooting) confirmed that Hicks's favorite film was Falling Down. "That always freaked me out. (Craig) watched it incessantly. He thought it was hilarious. He had no compassion at all," she told the Associated Press in February 2015, just after the shooting that was allegedly committed by Hicks. Falling Down has been the inspiration of musical artists such as Iron Maiden and Foo Fighters. The Iron Maiden song Man On The Edge is a basic summary of Falling Down, beginning with describing the opening traffic jam, and ending with describing the birthday present D-Fens buys for his daughter. The Foo Fighters' song, Walk, has a music video that is a recreation of scenes from Falling Down. ^ "Falling Down (1993)". Box Office Mojo. May 25, 1993. Retrieved June 15, 2012. ^ a b Canby, Vincent (February 26, 1993). 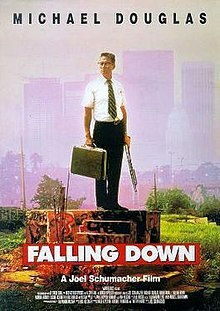 "Falling Down (1993) Review/Film; Urban Horrors, All Too Familiar". The New York Times. ^ "3 May 1992". Southern Illinoisan. p. Page 11. Retrieved October 11, 2016. ^ "Hollywood Film Crews Encounter Riot Delays". The Los Angeles Times. 1992-05-05. Retrieved 2016-10-11. ^ "Suprise". Detroit Free Press. 23 Jun 1992. p. 25. Retrieved 2016-10-12. ^ "Setting a Path Across L.A. With the Unhinged Antihero of 'Falling Down'". L.A. TACO. February 25, 2018. Retrieved 2018-03-05. ^ Murphy, Ryan (February 21, 1993). "MOVIES : 'Falling Down' Writer Has Seen the Future: It's L.A." Los Angeles Times. ISSN 0458-3035. Retrieved June 10, 2016. ^ Tibbits, John C. Falling Down: Conversations About the Film. University of Kansas. ^ "Groundhog Day (1993) - Weekend Box Office Results - Box Office Mojo". www.boxofficemojo.com. Retrieved 2016-10-06. ^ "Falling Down (1993) - Box Office Mojo". www.boxofficemojo.com. Retrieved 2016-10-06. ^ "Reelviews Movie Reviews". Reelviews.net. 1993-02-26. Retrieved 2013-08-18. ^ a b "Falling Down". Truby.com. ^ Ebert, Roger (February 26, 1993). "Falling Down". RogerEbert.com. Ebert Digital LLC. Retrieved July 4, 2018. ^ Hinson, Hal (February 26, 1993). "Falling Down". The Washington Post. Retrieved 2014-04-23. ^ Travers, Peter (February 26, 1993). "Falling Down". Rolling Stone. Archived from the original on April 23, 2014. Retrieved 2014-04-23. ^ a b "Kirk Douglas Defends Son". McCook Daily Gazette. March 23, 1993. Retrieved 2012-06-28. ^ Staff, A.V. Club (2012-10-12). "Our most-hated movies of the '90s". Film. Retrieved 2018-05-30. ^ Staff. "It's not the heat, it's the intensity: 13 memorable films set during heat waves". Film. Retrieved 2018-05-30. ^ Wolfe, April (2017-04-26). "Hey, White People: Michael Douglas Is the Villain, Not the Victim, in Falling Down". L.A. Weekly. Retrieved 2017-06-15. ^ a b Appelo, Tim (March 12, 1993). "'Down' Beat - Up in arms over Falling Down - Laid-off workers are offended by the Michael Douglas film". Entertainment Weekly. Retrieved 2012-03-17. ^ ""Falling Down" Under Fire". The Tennessean. 1993-03-03. Retrieved 2016-10-06. ^ "'Falling Down' won't play Korea." Rocky Mountain News, March 10, 1994. ^ "Michael Douglas on 8 of his greatest roles, from Gordon Gekko to Liberace". Retrieved 2016-10-06. ^ "White Male Paranoia". Newsweek. 1993-03-28. Retrieved 2017-04-12. ^ Wright, Bruce (6 April 2015). "Craig Stephen Hicks Chapel Hill Death Penalty Hearing: Man In Court Over Triple Murder of North Carolina Muslim Students". International Business Times. Retrieved 21 May 2015. ^ "Festival de Cannes: Falling Down". festival-cannes.com. Archived from the original on 2009-10-03. Retrieved 2009-08-18. Davies, Jude (2013-12-04). Falling Down. Macmillan International Higher Education. ISBN 9781137363084. Frauley, Jon (2010). " "Moral Transcendence and Symbolic Interaction in Falling Down". Criminology, Deviance, and the Silver Screen: The Fictional Reality and the Criminological Imagination. New York: Palgrave Macmillan.